Tyler Steenbergen (#17) looks to wire a shot past Evan Fiala (#47). Tyler Steenbergen knows the importance of finding different ways to win as a WHL season goes on. On Friday night at the SaskTel Centre, Steenbergen watched his Swift Current Broncos take on the host Saskatoon Blades in what turned out to be a more 1980s style run-and-gun game. The Broncos led 5-2 with seven minutes to play in the third period, before the hosts surged back with a pair of goals to cut the visitor’s edge to 5-4. The Blades got on the power-play with 2:13 to play looking for the equalizer. After the power play expired, Broncos overage centre Conner Chaulk scored into an empty-net with 6.6 seconds to play in the third to seal a 6-4 Swift Current victory. Chase Wouters scored for the Blades 24 seconds into Friday’s game. “I think we just laid off a little bit,” said Steenbergen, who had a goal and three assists in the win. “Obviously, we weren’t playing the way we wanted to in those last (seven) minutes. The Broncos, who are rated second in the Canadian Hockey League Top 10 rankings, return to Swift Current on Saturday to host the Lethbridge Hurricanes (7 p.m. local time, Credit Union i-plex), and Steenbergen said his team plans to stay focused for that entire game. The star right-winger, who leads the WHL scoring race with 24 goals and 18 assists, liked the resilience he saw from his side against the Blades. The Broncos resilience was tested early, when Blades centre Chase Wouters blasted home a midrange shot from the front of the Swift Current net to give the host side a 1-0 lead 24 seconds into Friday’s game. Steenbergen scored at the 4:08 mark to tie things up at 1-1. Tyler Steenbergen had a goal and two assists on Friday. Just 36 seconds later, Steenbergen and linemate Aleksi Heponiemi combined to set up a low driving point shot goal by defenceman Colby Sissons to put the Broncos up 2-1. At the 14:12 mark, the Broncos went ahead 3-1, when captain Glenn Gawdin potted his 12th of the season after a Blades skater gave away the puck in his own zone. “We stayed positive on the bench,” said Steenbergen. “Obviously, we knew on that first goal we broke down a little bit. Shortly after Gawdin’s goal, Blades 17-year-old defenceman Seth Bafaro received a major penalty and a game misconduct for nailing Broncos right-winger Kalden Elder from behind into the boards. That penalty call will trigger an automatic review by the WHL office for a possible suspension. Bafaro found himself fighting Elder’s linemate Kole Gable after that hit. Both were given fighting majors, and Gable received an instigator penalty and a 10-minute misconduct. Star overage left-winger Braylon Shmyr scored for the Blades during four-on-four action resulting from those infractions to cut the Broncos lead to 3-2 with 2:13 to play in the first. Heponiemi responded with his 13th of the season with 82 seconds remaining in the opening frame to give the Broncos a 4-2 edge. Goalie Ryan Kubic knocks the puck out of harms way. Both sides played a more under control second period, with the only goal coming from Broncos 18-year-old right-winger Logan Foster. Foster’s goal, which gave the Broncos a 5-2 advantage, was the first of his WHL career. The Blades pulled starting netminder Ryan Kubic after the second period. He turned away 10-of-15 shots to take the loss in goal for the Blades, who fell to 7-9-1. Joel Grzybowski turned away all six shots he faced making a relief appearance in what turned out to be a wild third. With 7:59 to play in the third, Shmyr appeared to have scored for the Blades, but the goal was waved off due to incidental contact on Broncos netminder and former Blades goalie Logan Flodell. Braylon Shmyr asks about his disallowed goal. The Blades didn’t get discouraged. Czech import defenceman Libor Hajek blasted home a shot from the point for the Blades to cut the Broncos lead to 5-3 with 6:44 remaining in the third. Right-winger Michael Farren scored on a rebound during a net scramble for his first goal of the season for the Blades to further cut Swift Current’s advantage to 5-4 with 5:30 to play in the third. The 3,664 spectators at the SaskTel Centre came to life after Farren’s goal. Chaulk took a cross-checking minor with 2:13 to play in the third, and the Blades pulled Grzybowski for an extra attacker with a minute to play in the frame. The host brought a pile of pressure, but couldn’t net the equalizer. Chaulk scored his empty netter after he got out of the penalty box. Flodell made 29 stops for the Broncos, who improved to 12-3-1. Outside of the final seven minutes of the third, Steenbergen was pleased with how his Broncos played. The NHL Entry Draft selection of the Arizona Coyotes thought his Broncos received a lot of strong contributes throughout the lineup. The Broncos celebrate their win over the Blades. He admitted he has enjoyed playing on a line with Gawdin at centre and Heponiemi at left wing. The trio was a force last season and is picking up where they left off this season. Heponiemi is the WHL’s second leading scorer with 13 goals and 29 assists, while Gawdin is the WHL’s fourth leading scorer with 12 goals and 23 assists. “We go into every game wanting to produce,” said Steenbergen. “We know where each other is going to be. The Blades travel to Brandon on Saturday to face the Wheat Kings (10-6-0-1). Bob Ridley called his 3,800th game as the Tigers play-by-play voice. The Medicine Hat Tigers made sure Bob Ridley, who is their iconic play-by-play voice, celebrated his 3,800th broadcast with a win. On Friday at the Scotiabank Saddledome in Calgary, the Tigers trailed the host Hitmen 1-0 and 2-1 before rallying for a 4-2 victory before 7,255 spectators. Mark Rassell scored twice for the Tigers, who received singles from Jaeger White and Kristians Rubins. Jakob Stukel and Luke Coleman replied with singles for the Hitmen. Jordan Hollett turned away 23 shots to pick up the win in goal for the Tigers (11-6). Nick Schneider made 26 stops to take the setback in goal for the Hitmen (6-11-1). 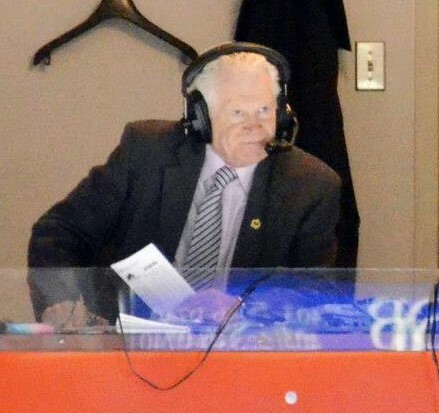 Ridley, who is the only play-by-play voice the Tigers have had now in their 48th season of existence, called his 3,800th game on Friday as the team’s radio broadcast voice. The 73-year-old’s game called total to date includes 3,380 of the Tigers 3,381 regular season contests, one standings tiebreaker game, all 399 contests the Tigers have played in the WHL playoffs and all 20 contests the team has played in the Memorial Cup tournament. The Tigers and Hitmen go at it again on Saturday at the Canalta Centre in Medicine Hat at 7:30 p.m. local time. Kaitlin Willoughby picked up her 100-career point with the Huskies. Kaitlin Willoughby hit a major career milestone in a win over the top ranked team in U Sports women’s hockey. On Friday at the Doug Mitchell Thunderbird Sports Centre in Vancouver, B.C., the 22-year-old Prince Albert, Sask., product and star forward became the fourth player in the history of the University of Saskatchewan Huskies women’s hockey team to hit the 100 career point plateau. With the Huskies locked in a 0-0 tie entering the third period with the host University of British Columbia Thunderbirds, Willoughby scored on a short-handed breakaway to give the Huskies a 1-0 lead and picked up an assist on an empty-net goal by rookie centre Chloe Smith to give U of S a huge 2-0 upset victory. Willoughby’s two points on Friday give her 45 career goals and 55 career assists for 100 career points in regular season play. At the moment, Willoughby is tied for third with Cara (Wooster) Muench, who played from 2010 to 2013, for third on the Huskies all-time career regular season scoring list. Muench, who also played two seasons for the now defunct University of North Dakota women’s hockey team, had 36 goals and 64 assists in her three seasons with the Huskies. In her first career U Sports regular season start, netminder Jessica Vance made 33 saves to earn the shutout win. Playing for the Prince Albert Northern Bears from 2010 to 2015, Vance became one of the Saskatchewan Female Midget AAA Hockey League’s all-time greatest goalies posting a 48-36 record, a 2.27 goals against average, a .926 save percentage and 16 shutouts in 91 career regular season games. Her 48 wins, 16 shutouts and 91 games played are all SFMAAAHL career regular season records. Tory Micklash turned away 27-of-28 shots to take the setback in goal for the Thunderbirds. The Huskies improved to 6-2-1 with the win to sit first in the Canada West Conference a point ahead of the Thunderbirds (6-3) and the U of Manitoba Bisons (6-3). The Huskies and Thunderbirds go at it again on Saturday in Vancouver. Jordon Cooke picked up his 49th career regular season win for the Huskies. An overtime win by the U of Saskatchewan Huskies men’s hockey team has put star goalie Jordon Cooke on the verge of becoming the third netminder in team history to win 50 career regular season games. On Friday night at the ancient Rutherford Rink, Cooke made 22 saves to back the Huskies to a 4-3 overtime victory over the UBC Thunderbirds. The win was the 49th of Cooke’s U Sports career. At the moment, Jeff Harvey and Ryan Holfeld are the only goalies in the history of the Huskies men’s hockey team to crack the 50-win plateau in career regular season victories. Harvey leads the Huskies with 60 career regular season wins playing from 2005 to 2010. Holfeld is second on the Huskies career regular season wins list collecting 53 victories playing from 2010 to 2015. Against the Thunderbirds on Friday, Levi Cable scored 68 seconds into overtime to give the Huskies the win. Logan McVeigh scored twice for the U of S, while Michael Sofillas had a single. Manraj Hayer, Austin Vetterl and Chase Clayton all netted singles for the Thunderbirds. Matt Hewitt turned away 37 shots to take the loss in net for the Thunderbirds. The Huskies, who are rated fourth in the U Sports Top 10 rankings, improved to 7-1-1 with the win. The Thunderbirds record moved to 5-3-1. The two team go at it again on Saturday at 7 p.m. at Rutherford.